The 2017 Victory Octane is the future of the American cruiser segment, at least if Polaris has anything to say about it. Gone are the days of the same old designs paired with the same old motors. Cruisers can be tough and modern and American, and Victory is pushing their chips all in. We’ve been waiting for this bike for a long time. Harley-Davidson has long had a stranglehold on the cruiser market and, for too long, competitors like Victory seemed all too happy to try and copy them and take The Motor Company’s table scraps when they could. But then Victory’s parent company Polaris bought Indian, and the released the Indian Scout and Indian Scout Sixty. Two all-new and properly well designed and well performing motorcycles. They quit copying Harley and started creating their own version of the classic cruiser - and it was excellent. With that, we knew the same was coming for Victory. 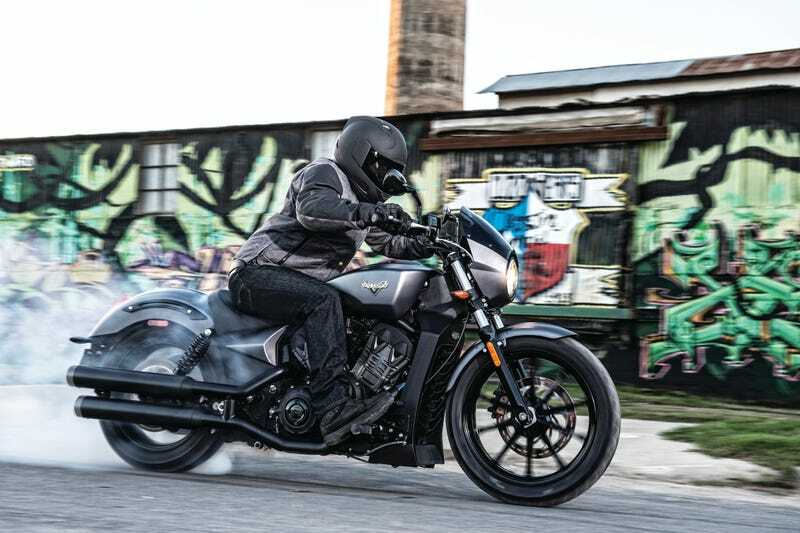 Polaris had seen the success of breaking the mold and creating some brand identity outside of “that other cruiser that isn’t a Harley,” and they already had the “classic” thing taken care of with Indian. When they sent CycleWorld’s Don Canet up Pikes Peak on a the Project 156, which used an all new and liquid-cooled motor, we knew they had more plans for the platform. Today, they’ve launched what is likely the first step forward into a new Victory. Something that isn’t spec-matched to a Road King with the physical appearance of Judge Dredd, something new. At the center of the Octane is a 1,200 cc, liquid cooled V-twin making 104 horsepower and 76 pound-feet of torque. Victory claims that means 12 second quarter miles and a 0-60 time under four seconds. They also claim the Octane has 32 degrees of available lean angle, though those foot forward controls don’t exactly inspire confidence in riding this thing hard in the twisties. The Octane gets a cast aluminum, semi-double-cradle frame with dual rate springs front and back. Unfortunately, that spring is housed in a fairly budget, right side up fork up front. It’s hard to get excited about the single 298 disc and two-piston caliper charged with providing stopping power up front. The same is mounted to the rear, only it gets a single piston caliper, which sounds a little less than ideal for slowing down the 528 pound (dry) machine. I’m incredibly torn on this motorcycle, but I guess that just means I’ll have to ride the thing. It takes nice brakes and suspension to go fast, neither of which seem to be included here, and why they put forward controls on this thing is beyond me. However, the new motor, while not exactly making Ducati Diavel numbers, is a massive step in the right direction—and I dig the way the bike looks. This bike may or may not be what I hoped, but it’s certainly a big step in the right direction, shows that Victory can be both fully cruiser and fully modern, and gives Victory a potentially wonderful new motor to play with.